All-Star Non-Stop Indie-Lit Variety Show! 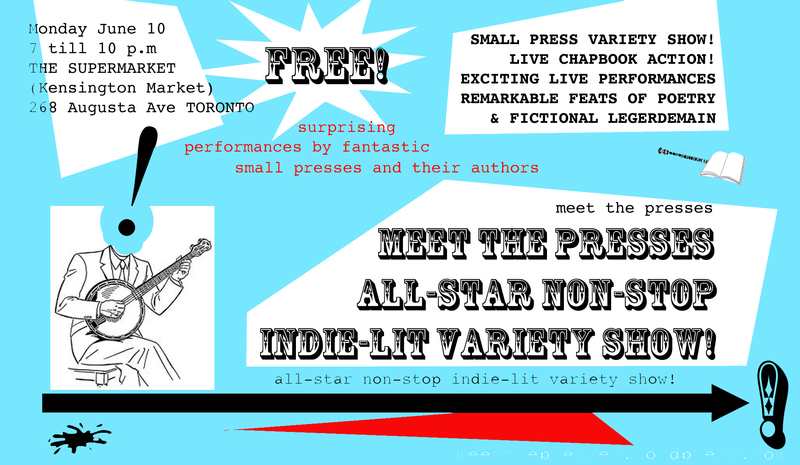 Meet the Presses is curating a third Indie Literary Market for November 17 at the Tranzac Club in Toronto. Meet the Presses is an all-volunteer literary collective devoted to organizing public events showcasing books and chapbooks, magazines, recordings, and broadsheets produced by independent publishers of fiction, poetry, and creative non-fiction. The collective has come together in the spirit of the original Meet the Presses events begun 28 years ago in Toronto by Stuart Ross and Nick Power. The Indie Literary Market is an invitational event focused exclusively on things literary. It will provide an opportunity for the public to meet independent literary presses and make direct purchases of publications that may not be readily available (or available at all) in bookstores and other commercial outlets. Admission is free. Clinton’s has a great selection of food and drink for purchase. Some of us believe the chapbook is the natural and friendly form for publishing poetry, fiction, and non-fiction. Come join us and check out this stubborn resister of eBooks and spines! This is a Scream Unfestival event. 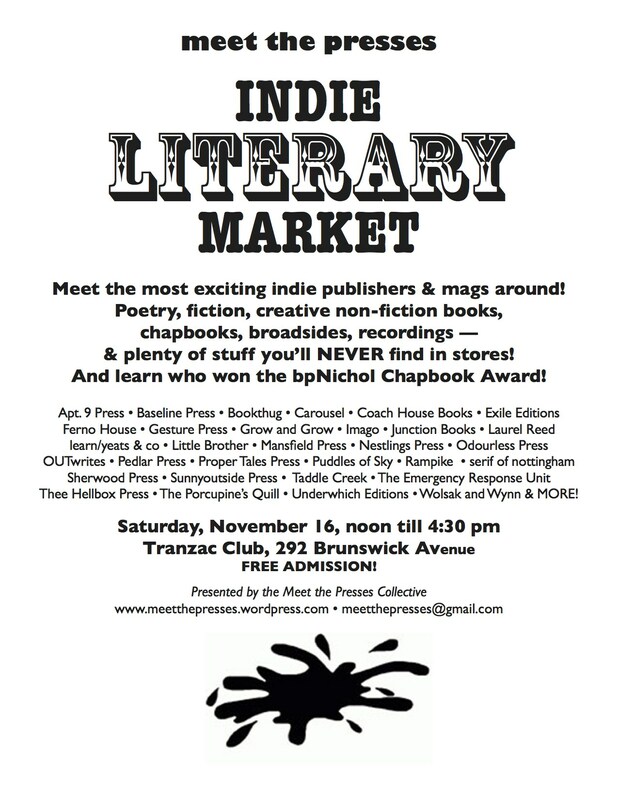 Presenting … the 2nd Indie Literary Market! This is Toronto’s only all-literary indie-publisher showcase! You’ll find cutting-edge fiction, poetry, and creative non-fiction from some of the most exciting, challenging publishers in Canada. Come meet dozens of Toronto’s best literary publishers of fiction, poetry and creative non-fiction! Literary books, chapbooks, broadsides and recordings for sale – including lots of stuff you’ll never find in stores! Free admission! Cash bar! Great food!